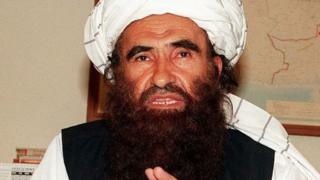 The founder of the Haqqani militant network has died after several years of illness, the Afghan Taliban has announced. Jalaluddin Haqqani was a significant militant figure in Afghanistan and had close ties to both the Taliban and al-Qaeda. His son is believed to have taken over control of the group in 2001. The Haqqani network has been behind many of the co-ordinated attacks on Afghan and Nato forces in recent years. There were no details in the statement about the date or place of Haqqani's death. "Just as he endured great hardships for the religion of Allah during his youth and health, he also endured long illness during his later years," a statement from the Afghan Taliban said. Rumours about Haqqani's death have circulated for years. In 2015, sources close to the group told the BBC that the leader had died at least a year earlier. This was never confirmed. Jalaluddin Haqqani was an Afghan guerrilla leader who fought Soviet troops when they occupied Afghanistan in the 1980s. US officials have admitted that at the time he was a prized asset of the Central Intelligence Agency (CIA). Who shot the militant at the bakery? However, he later allied himself to the Taliban after they took power in Afghanistan in 1996. In its statement, the Taliban called Jalaluddin Haqqani an "exemplary warrior... and among the great distinguished jihadi personalities of this era". The Haqqani network was one of several militant groups that operated from the tribal areas along the Afghan-Pakistan border following the US-led military campaign in Afghanistan, which ousted the Taliban in 2001. The group, which it is alleged largely operates from Pakistan, has also been blamed for some of the deadliest attacks in Afghanistan, including a truck bomb explosion in Kabul in 2017 that killed more than 150 people. Jalaluddin Haqqani may not have been playing a significant operational or strategic role at the time of his death, but his loss is still significant for the militant group he founded. Although he was no longer a key player - having ceded control to his son Sirajuddin Haqqani some years ago - it is widely believed that he still played an advisory role, and his death will be a huge emotional loss for the group. The Haqqani network currently remains among the most powerful and feared militant groups in Afghanistan - some say it has more clout than other outfits such as the Islamic State group. Haqqani militants have been blamed for numerous deadly terror attacks in the country, including last year's suicide truck blast in the capital. It is significant that the Taliban have chosen to emphasise that he died of "natural causes" and after a long illness. This seems to be a direct reference to multiple rumours of his death earlier. Nasiruddin Haqqani: Who shot the militant at the bakery?